While every single day of every single year is a great opportunity to build out and increase your wealth and passive income, the start of a new year is a particularly good time to look at investment ideas that could hold the potential to deliver better results than most other investment ideas available. With this in mind, I’m going to reveal my top 10 stock ideas for 2018! While these are highly worthwhile investment ideas to consider for this year, every stock listed could and probably should be thought of as a very long-term investment. 2018 could indeed be just the start of a very long runway for growing profit, increasing dividends, and happy shareholders for decades to come. These stocks have passed a few hurdles to be considered. First, they’re all dividend growth stocks. 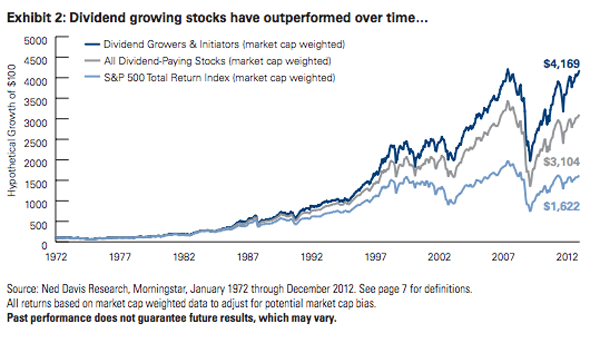 Per Ned Davis Research, dividend growers & initiators outperform the broader market over the long-haul. The truth is that dividends aren’t just a component of the market’s total return over the long term; they’re the main component. And reinvesting growing dividends all the way along can only exacerbate that. The second hurdle cleared is, these are all high-quality businesses both in terms of fundamentals and competitive advantages. It’s one thing to be a dividend growth stock. It’s quite another thing to be a truly wonderful business. While some dividend growth stocks have seen their best days come and go, many are still firing on all cylinders. We’re focusing on the latter here. You’ll find strong top-line and bottom-line growth, robust profitability, reasonable amounts of leverage, great dividend growth metrics, and numerous competitive advantages among these stocks. Moreover, every company featured here has a business model that’s fairly easy to understand, because it’s important to invest in businesses that are within your circle of competence. You want to intimately understand how a company will make a lot of money for you throughout the next year, as well as many years thereafter. The last hurdle we wanted to clear is valuation. Every dividend growth stock featured below appears to be undervalued at the time of publication. As I note throughout the Undervalued Dividend Growth Stock of the Week series, a high-quality dividend growth stock that’s undervalued can confer multiple benefits to the long-term investor: a higher yield, greater long-term total return prospects, and less risk. These benefits are in comparison to what would otherwise be available if the same stock were fairly valued or overvalued. Even the best business can be a poor investment, especially over a shorter period of time (like the year ahead), if one pays far too much for the stock. But if one is able to invest in a great business at perhaps an equally-great value, they’re setting themselves up for truly outstanding investment performance over both the short term and long term. Money works harder, one’s expected passive investment income rises, and compounding’s power is unleashed in a magnificent way. Looking forward to 2018, recent changes to tax law (including a permanent reduction in the US corporate tax rate) could benefit many businesses based in, or with heavy exposure to, the United States. But this is also occurring in an environment in which the broader stock market (i.e., the S&P 500) is elevated off of historic norms. And so it’s never more important than to look for wonderful businesses trading for attractive valuations. With all of this in mind, I’d like to introduce you to my top 10 stock ideas for 2018. This is a global biotechnology company that develops and manufactures a range of human therapeutics. With a global population that is growing bigger, older, and richer, demand for the type of life-prolonging, life-improving, and life-saving therapeutics that Amgen develops and manufactures is only likely to grow. This bodes well for the $120 billion (by market cap) biotechnology firm. While they’ve only paid an increasing dividend for eight consecutive years, the dividend metrics are otherwise very impressive. There’s the market-beating yield of 2.99% that’s also more than 100 basis points higher than the stock’s own five-year average yield. The five-year dividend growth rate is a monstrous 48.2%. And with a payout ratio of 47.8%, you’re looking at what’s basically a “perfect balance” between retaining earnings for company growth and returning cash to shareholders. This payout ratio is still below 50%, even after a very recent dividend increase of almost 15%. Dividend growth in the double digits looks likely for the foreseeable future, and much of this belief is based on excellent fundamentals. The company has compounded its earnings per share at an annual rate of 15.41% over the last decade, which is almost unheard of for such a large company over a stretch of time that included one of the worst financial crises my generation will probably ever see. And the balance sheet gives the company a lot of flexibility. While the long-term debt/equity ratio of 1.01 and interest coverage ratio of just over 8 aren’t spectacular, the company also has almost $40 billion of cash and cash equivalents. Much of this is overseas, but the aforementioned recent tax law changes in the US also includes a one-time tax break on repatriated cash – this is provoking Amgen to bring at least some of this money back home. That means additional ammo for the company in terms of growth, improving the balance sheet, buybacks, and dividends – this all bodes well for shareholders. Competitive advantages, including scale, existing patents on blockbuster drugs (such as Enbrel), broad geographical and product diversification, R&D, and a strong pipeline of drugs (16 compounds in Phase III trials) give this firm the strengths it needs to fight risks like competition, litigation, and regulation. Looking at the valuation, the P/E ratio of 15.94 is well below the stock’s own five-year average P/E ratio of 18.6. That’s also far lower than the broader market’s P/E ratio. And the stock’s yield, as noted earlier, is significantly higher than its recent historical average. And check out the incredible margin: Amgen has averaged net margin of 28.74% over the last five years. It’s market-beating growth and yield at a below-market valuation. Amgen is one of my best ideas for 2018. But it’s frankly one of my best ideas for many more years to come, which is why I’m a shareholder. I recently concluded that the stock has a fair value of about $191, which offers 10% upside. Add in that ~3% yield and an expectation for near-term compound annual EPS growth of 7%. You could be looking at as much as a 20% total return over the next year! I’m contemplating adding to my position here. For more information on Amgen, check out my most recent Undervalued Dividend Growth Stock of the Week article on this high-quality dividend growth stock. In addition, I shot a complementary and in-depth analysis and valuation video on the stock. This company manufactures and markets a variety of branded food products, beverages, pet foods, and pet snacks. JM Smucker is a fantastic business, and its product offerings go way beyond its namesake jams. This company should be best thought of as 1/3 coffee, 1/3 food products, and 1/3 pet foods and pet snacks. Lest you think this company is just PB&J section of your grocery store, keep this in mind: the company has the #1 market share in: peanut butter, fruit spreads, at-home coffee brand, and dog snacks. So wherever they do business, they do better than their competition. They’re brands are the “go-to” brands when customers are buying these respective products. And due to the company’s brand power and recognition, this seems unlikely to abate anytime soon. The likelihood of consumers continuing to buy brands like Jif, Smucker’s and Folgers should continue to fuel growing dividends, which is something JM Smucker Co. is incredibly efficient at. They’ve been paying out an increasing dividend for 20 consecutive years, with a 10-year dividend growth rate of 9.8%. With a payout ratio of 65.7%, near-term dividend growth will probably be moderate. Still, you’re also looking at a very healthy 2.49% yield here, which just so happens to exceed both the broader market and SJM’s own five-year average yield. So there’s plenty of income being pumped into shareholders’ pockets while the company continues to just dominate the areas in which it competes. Business growth has been strong over the last decade, with revenue compounding at an annual rate of 12.68% between fiscal years 2008 and 2017. EPS compounded at an annual rate of 6.07% over that period. The solid fundamentals extend to the balance sheet, although the company is actively (as they should) improving the leverage: the long-term debt/equity ratio is 0.65, while the interest coverage ratio exceeds 6. Robust profitability and an improving balance sheet indicates management is running this business in an intelligent and prudent manner. And with most of its sales originating from inside the US, there’s a huge runway for international growth here. Now, the stock has recovered quite a bit since I noted it as undervalued in mid-November 2017 for readers via an Undervalued Dividend Growth Stock of the Week article (when I was personally loading up on the stock), but the stock was still down ~2% for the year of 2017 (versus a climb of almost 20% for the S&P 500 index over 2017). My recent valuation can be moved up a bit after taking another look at the numbers (the analyst valuations I reflect in my articles have improved since I published my article), but the near-term upside still seems to be less than 5%. However, if you add that into the near-term 10% compound annual growth for the company’s EPS that is expected by at least one professional analysis firm, you’ve got a case for double-digit total return very quickly (assuming the valuation doesn’t compress). And then you can add in that 2.5% yield, too. This business is about as easy to understand as making a PB&J sandwich. And it’s a low-risk play. This is the kind of company you invest in for decades. But I think it’s still set up very nicely for the next year. For a great look at this business, check out the analysis and valuation video that we have available for you readers. Williams- Sonoma is a nationwide multi-channel retailer of high-quality home products and furnishings. Not only is e-commerce not killing Williams-Sonoma, the company advantageously moved into e-commerce years ago. Seeing the curve before the signs, this smart retailer built out its online offerings. It’s now using the rise of online buying to its advantage in a major way. More than half of the company’s revenue is derived from its e-commerce segment. So bring on the e-commerce. That’s what’s fueling this company’s growth. It’s also fueling that dividend growth, which is music to a dividend growth investor’s ears. The company has increased its dividend for 12 consecutive years. And these aren’t small increases that a dying business would hand out: the 10-year dividend growth rate stands at a monstrous 17.1%. Now, the payout ratio has expanded as the company went from a small dividend to a big one. At 44.4%, however, less than half of the company’s earnings are being returned to shareholders via a dividend, providing plenty of room for more increases going forward. And what could be lower dividend growth moving forward (relative to that big 10-year DGR) is compensated by a relatively high yield of 2.97%. That yield, by the way, is much higher than the industry average and the broader market. And it’s almost 80 basis points higher than the stock’s own five-year average yield. More ongoing passive income in my pocket? Since total return is comprised of income (via dividends or distributions) and capital gain, with the former counting much more over the long term, the case for this stock having a great 2018 is certainly already there based on that higher-than-average yield. Meanwhile, the company’s bottom line continues to march higher, with both the rise of e-commerce giants and the financial crisis unable to stop this company over the last decade: Williams-Sonoma posted a 7.63% compound annual rate for EPS between FY 2007 and 2016. Oh, and the balance sheet is flawless. This is another case where the stock has gone on a big run since I flashed it as undervalued via an Undervalued Dividend Growth Stock of the Week article, which was published back in August 2017. But the stock is still available for a P/E ratio of 14.96, which is absurdly low for a quality company in this market. The S&P 500 is going for way over 20. And the five-year average P/E ratio for this stock is 20.2. There’s a clear disconnect here. What could be 10% upside (if the price catches up to estimated intrinsic value), a near-term forecast for 10% compound annual EPS growth, and a 3% yield adds up to what could be a 23% total return over the next year! 2018 could be phenomenal for the stock, but I don’t see any reason why this company can’t continue pumping out bigger dividends and higher returns for shareholders for many years to come. For an even deeper dive into Williams-Sonoma, an in-depth analysis and valuation video is available for viewing. This is a holding company that provides domestic and international communication and entertainment services. AT&T probably needs no introduction, but the business probably isn’t quite what you think. That’s because they’ve been so busy diversifying and transforming the business over the last decade or so. AT&T moved heavily and aggressively into the wireless communications business years ago, seeing the writing on the wall regarding the shift away from landlines. But they’ve more recently moved largely into media and entertainment, which is set to make them one of the largest entertainment and communications conglomerates in the world. In fact, even the vaunted wireless business (via its wireless segment) is now only about 45% of the company’s sales. And the aggressive pursuit of Time Warner Inc. (TWX) (which is currently experiencing heavy regulatory scrutiny) could serve to further reshape AT&T into a diversified entertainment conglomerate that would be vertically integrated (delivering content via its DirecTV business and also producing content), with a massive communications business thrown in. All that said, what could be an acceleration of growth is really icing on the cake, as the stock offers a massive yield of 5.13% here. And that big dividend continues to increase like clockwork: AT&T has grown its dividend for 34 consecutive years. Now, the increases aren’t massive. They’re roughly in line with inflation. We’re talking ~2% annually here. But protection (and perhaps even a slight improvement) of an investor’s purchasing power, when keeping that huge yield in mind, is worth plenty. And we could see something better if/when (it’s still a big if) the TWX acquisition closes. The payout ratio – it’s currently near 100% – might portend a dividend cut at first glance, but AT&T routinely takes large adjustments to GAAP EPS. The company is comfortably covering its dividend via free cash flow. In my view, this big dividend looks safe. And the balance sheet shouldn’t cause any stress. The long-term debt/equity ratio of 0.92 is right in line for this industry. And the interest coverage ratio of over 5 is of no immediate concern. This isn’t the kind of stock you count on for big growth, though: the top-line and bottom-line are moving along at a low-single-digit pace, compounded annually. But it’s a big dividend that almost automatically gives you some upside throughout 2018. You’re likely looking at a nice chunk of passive dividend income, at the very least. There could be more, however. The stock has advanced considerably since I published an Undervalued Dividend Growth Stock of the Week article on it, highlighting the fundamentals and valuation as compelling. But the valuation has also improved a bit since then. A recent dividend increase and an analyst upgrade on the valuation would increase the stock’s estimated intrinsic value closer to $40. ~3% upside, ~3% business growth, and a 5%+ yield moves you into double-digit total return territory pretty fast (for 2018), with a lot of that coming via a big cash payout. Life could be worse than being an AT&T shareholder right now. 2018 could be a great year for the company, especially if that Time Warner Inc. acquisition closes. Either way, though, this stock looks set up very nicely for both the next year and the next decade. It’s one of my largest positions. The video we published on this stock highlights the company’s opportunities, fundamentals, and valuation. Take a look! Walt Disney Co., together with its subsidiaries, operates as a global diversified media and entertainment conglomerate. What AT&T is somewhat attempting to shape itself into, is what Walt Disney Co. already is. With its successful and sought-after parks, its massive film studio, the numerous successful cable channels, one of the US’s major broadcast networks (ABC), and its complementary consumer products business, Walt Disney is in a category of its own. Meanwhile, the company just recently announced that it offered just over $52 billion for certain entertainment assets of Twenty-First Century Fox Inc. (FOXA). This would only add to Walt Disney Co.’s scale and breadth, and it would also put the company in control of two of the “Big Six” domestic movie studios. With or without the Fox assets, Walt Disney operates an impressive business. This impressiveness extends to the dividend. The company’s dividend growth streak of eight consecutive years appears to be just warming up, with a payout ratio of 29.5% all but guaranteeing strong future dividend increases (which should drive some of that near-term and long-term total return). The current yield of 1.55% might not be massive like AT&T’s dividend (which is why we diversify, and it’s why I’m listing 10 different stocks with different dynamics here), but Walt Disney more than makes up for that via strong dividend growth: the five-year dividend growth rate is 30.1%, which is one of the higher rates you’ll run across. Now, I wouldn’t expect that kind of dividend growth to continue indefinitely, but strong underlying business growth should continue to fuel double-digit annual raises for the foreseeable future. To put that business growth in perspective, Walt Disney Co. posted 10.70% compound annual growth in its EPS over the last 10 fiscal years. Solid top-line growth, continued buybacks (the outstanding share count will be impacted by the Fox deal), robust profitability (we’re talking net margin that averaged 15.63% annually over the last five years), and the potential for additional scale gives the bottom line plenty of fuel for 2018 and on. Plus, the company has an outstanding balance sheet, sporting an interest coverage ratio north of 28. The stock is trading hands for a P/E ratio of 19.09. That’s well below the broader market and industry average. And it’s also below the stock’s own five-year average P/E ratio. A recent valuation on the stock, via an Undervalued Dividend Growth Stock of the Week article, pegged the estimated intrinsic value near $128. Although the stock has moved up modestly since I wrote that article, the stock’s price meeting that estimate could provide for around 19% upside alone. Adding in an estimate of 7% compound annual growth for Walt Disney’s EPS over the near term and the stock’s yield puts the total return closer to 28% over 2018 alone. This might be one of the best investments available for 2018 – and that goes for dividend growth investors and non-dividend investors alike. But this is also the kind of stock you buy and just put away for a generation for two. Think long term here. A video exploring Walt Disney Co.’s business and valuation was shot over the summer of 2017, and it’s definitely worth a watch if you’re interested in this stock. This is an energy distribution and transportation company that owns and operates crude and natural gas pipelines across the United States and Canada. After merging with Spectra Energy Corp. in 2017, Enbridge is now the largest energy infrastructure company in North America. All the talk about clean energy is fun and exciting. But we’re still a far ways off from powering the world via solar, water, and wind power. Meanwhile, a lot of the “clean energy” options (like hybrid/electric vehicles) still require the power grid, which – you guessed it – largely uses traditional energy sources (like natural gas). As such, this is a play for 2018 and 2028 (and likely 2038). But the near term looks particularly compelling, especially for dividend growth investors. First, let’s consider the stock yields, incredibly, 5.49%. That’s the highest yield on this list. The only thing to keep in mind is that Enbridge is a Canadian company that declares and pays its dividend in the Canadian dollar, which may impact an investor’s tax situation. However, you’re not getting just income here; Enbridge is no slouch when it comes to dividend growth: the company has paid an increasing dividend for 22 consecutive years. with a 10-year dividend growth rate of 12%. That DGR isn’t markedly slowing down, either, with the most recent increase (announced in November 2011) coming in at 10%. You just don’t often find yields of 5.5% in combination with double-digit dividend growth. Indeed, Enbridge, after merging with Spectra, expects to grow its dividend at an annual clip of 10% through 2020. They’re already living up to that expectation. Now, because of Enbridge’s business model (a midstream pipeline company), Enbridge’s reported EPS numbers are largely impacted by depreciation on assets that may not be depreciating at the reported rate (many of these pipelines actually become worth a lot more over time). The best number we can use for an accurate look at profit in Enbridge’s case is adjusted cash flow from operations (ACFFO). As I noted in the most recent Undervalued Dividend Growth Stock of the Week article on this stock, Enbridge grew its ACFFO at a compound annual rate of 7.94% over the last ten fiscal years. That’s a much better result than a lot of other energy companies, where investors have saw decimated fundamentals in the wake of cratering energy commodity prices. This is because over 90% of the company’s cash flow is supported by long-term commercial contracts, which means it largely relies on the fees it collects as commodities pass through its pipes. An acceleration in ACFFO growth could materialize with company reaching new heights in scale, but even just a continuation of 8% annual underlying business growth provides a lot to like. The main drawbacks to this business are in the very business model: there is always risk in operating pipelines (spills, explosions, etc. ), and the asset-intense nature of the company means debt hangs a bit heavy. Enbridge’s 10% dividend increase and recent valuation upgrades from analysts have moved its valuation up a bit since I published my aforementioned article on the stock. A revised valuation could potentially put the stock’s valuation to over $50/share. So we might have 28% upside here (based on the difference between current price and potential estimated intrinsic value). That could be added on to the company’s current trajectory for 7%+ compound annual ACFFO growth. And then you have the 5.5% yield to boot. That adds up to a possible 40%+ total return picture for 2018. Even if Enbridge falls well short of that, it wouldn’t take much for the business to be an outstanding investment for 2018… and many years thereafter. I’m eagerly anticipating adding to my position in the short term. This is a medical devices and technology company that develops, manufactures, and markets a variety of therapeutic products to hospitals, physicians, clinicians, and patients across approximately 160 countries. This company has similar long-term tailwinds to what Amgen will likely experience: the fact that the world is growing older is directly correlated to the improvement in, increasing access to, and growing demand for high-quality healthcare. Products that prolong, improve, or safe your life are not really “discretionary” in nature. While Amgen approaches this from a pharmaceutical angle, Medtronic approaches it from a medical products angle. In my view, a portfolio can and probably should have room for both. Meanwhile, a dividend doesn’t get much more bulletproof than Medtronic’s. We’re talking 40 consecutive years of dividend increases here, a 10-year dividend growth rate of 14.7%, and an “almost-perfect” payout ratio of 50.5%. If you want a stock that you can “bet your retirement on”, leading to almost guaranteed passive dividend income, this is about as good as it gets. The only real drawback to the dividend metrics might be the current yield: it’s sitting at 2.26%. Still, that beats the broader stock market. And it’s higher than the stock’s own five-year average yield. Medtronic grows like clockwork, although recent adjustments (relating to acquisitions, especially the $50 billion acquisition of competitor Covidien) have took a bite out of GAAP EPS. But adjusted EPS for FY 2017 would show a company that doubled its net income per share over the last decade. And there’s an expectation for near-term compound annual growth in Medtronic’s EPS at the 9% mark. The balance sheet is solid – the long-term debt/equity ratio is 0.52, while total cash on the balance sheet is 50% of long-term debt. And I believe the balance sheet will only improve after Medtronic’s business normalizes. Profitability, meanwhile, is robust: net margin has averaged 15.59% per year over the last five years. While strong, this, too, should improve moving forward. The stock is available for a P/E ratio of just over 22 right now – and that’s using weak GAAP EPS. Yet it’s still well below the stock’s own five-year average P/E ratio of 23.9. And the industry average P/E ratio is near 40. My recent Undervalued Dividend Growth Stock of the Week piece on this stock concluded that it appeared to offer 15% upside from recent prices. Factor in what might be high-single-digit business growth over the next year, as well as what’s currently a yield of just over 2.25%, and you could easily make a case for what might be a total return of ~25% for 2018. While it’s a business that’s sitting mighty pretty for 2018, it’s also positioned very well for long-term tailwinds that could reward shareholders for decades to come. This company is an apparel marketer and manufacturer, with a portfolio of apparel brands across t-shirts, innerwear, casualwear, activewear, socks, and hosiery. If you want to be part of modern-day society, you have to wear clothes. As such, many consumers out there are looking to fulfill this basic requirement by purchasing high-quality garments at a good value. That’s where a company like Hanesbrands comes in. They strike a great balance between quality and value via their numerous brands that include: Hanes, Champion, Playtex, Bali, and Maidenform. And striking that balance results in this: in the United States, Hanesbrands sells more units of intimate apparel, male underwear, socks, shapewear, hosiery and T-shirts than any other company. This should translate into increasing profit and dividends, which has already translated pretty well over the recent past. The company has paid an increasing dividend for five consecutive years. They’re making up for lost time via big dividend raises. The three-year dividend growth rate is 43.1%. And the most recent increase came in over 36%. With a payout ratio of 37.2%, there’s still plenty more room for more big dividend increases. This is on top of a yield that’s currently clocking in at 2.94%. That dividend growth has largely been fueled by excellent business growth, with Hanesbrands registering a compound annual growth rate of 17.42% in its EPS over the last 10 fiscal years. The company’s net margin has essentially tripled over that period. However, acquisitions (which have helped fuel some of this growth) have pressured the balance sheet: the long-term debt/equity ratio 2.87, and the interest coverage ratio is sitting just under 5. With plenty of growth opportunities on the international and direct-to-consumer sides of the business, there’s an expectation that Hanesbrands will continue to compound its EPS at a like rate over the foreseeable future. Growing a business at 16% to 18% annually can obviously lead to phenomenal results, assuming the price paid at the time of investment isn’t too egregious. Well, the valuation seems incredibly appealing here. The P/E ratio is sitting at 12.68 right now, which means we’re looking at a PEG ratio below 1. This is a P/E ratio that is almost half the broader market, on a business that’s growing much faster than the average business in the S&P 500. The price/cash flow on this stock is sitting at 1/3 of its respective three year average. A recent Undervalued Dividend Growth Stock of the Week article I published on the stock indicated it had a fair value price of about $24. The stock has come down a bit since then, but some analyst valuation numbers have also declined some. So it’s roughly a wash. If you look at 14%+ upside (the difference between prevailing prices and the estimated intrinsic value), 15%+ annual EPS growth, and a ~3% yield, that adds up to over a 32% total return for 2018 alone. While the balance sheet is a bit of a concern here, this stock appears to balance quality and value just like the company’s product lineup. I just recently bought this stock for my personal portfolio. Omnicom Group Inc. is an advertising, marketing and corporate communications company. The second-largest company of its kind in the world, Omnicom has achieved an incredible amount of scale, diversification, breadth, and depth across its entire business. To wit, the company has over 5,000 clients in more than 100 countries. The largest client represented just 3% of FY 2016 revenue, with their top 100 clients making up 52% of revenue. As you can probably imagine, a business like this is set up pretty well for secular growth. Indeed, the company’s profit barely budged downward during the financial crisis and ensuing Great Recession, which is something one cannot say for many of Omnicom’s own clients. This bodes well for the continued pumping of ever-larger dividends into shareholders’ pockets. The company’s nine consecutive years of dividend growth looks set to continue for many years to come, with the low payout ratio of 47.8% allowing for a great equilibrium between retaining profit (for company growth/expansion) and returning profit to shareholders. The five-year dividend growth rate is a massive 17.2%, and the stock offers a very appealing yield of 3.26%. That yield, by the way, isn’t just much higher than the broader market, it’s also almost 90 basis points higher than the stock’s own five-year average yield. So the dividend metrics are ticking all the boxes you want to see. But the dividend (and growth of it) is really just the end result of Omnicom running a solid business. The company compounded its EPS at an annual rate of 5.51% over the last decade. Not massive growth to be sure, but the almost-constant YOY increase in EPS is rather notable – the only FY over the last decade in which Omnicom didn’t manage a yearly increase in EPS was in FY 2009, yet the company still managed a very respectable profit for that year. Sizable annual buybacks have helped their cause, with the outstanding share count down by 27% over the last 10 years. Indeed, Omnicom typically returns (via a combination of dividends and share repurchases) ~100% of its net income back to shareholders, every year. You’ve gotta love it. Strong profitability, a balance sheet that isn’t overly leveraged (the interest coverage ratio is near 10), and a collection of wonderful businesses make this what is, in my view, an excellent long-term investment candidate. But it’s also set up well for 2018, with what looks like a very reasonable valuation. The stock is available for a P/E ratio of 14.66 here, which compares favorably to the stock’s own five-year average P/E ratio of 17.1 (not to mention the broader market). Coupling that lower valuation on the company’s earnings with the much higher current yield leads to a lot of upside, along with what could be more near-term and long-term income from the stock. A good look at the valuation indicates the stock could be intrinsically worth approximately $82/share, which would point to 12% upside. An expectation for near-term compound annual EPS growth from the firm is coming in at 8%. And then you have that 3.25% yield. That adds up to what could be a total return of ~23% for 2018. One could do a lot worse than invest in this stalwart of a business. That goes for 2018 and beyond. And I just recently initiated a stake in the stock myself. This company operates and franchises pizza delivery and carryout restaurants, with more than 5,000 restaurants spread out across 50 US states and 45 countries. It’s last, but it’s certainly not least. Pizza is timeless. And it’s something even a child can understand from a business and investment perspective. People are going to eat a lot of pizza in 2018. And more people are probably going to be eating pizza 10 years from now. If you provide a high-quality product at a good value, you’re going to do well. This is a platform upon which Papa John’s has become one of the world’s largest pizza chains, but a sky-high valuation, slight slowdown in business, and CEO stepping down have combined to punish this stock tremendously throughout 2017. Indeed, this stock is a great example of why valuation is important. Even though the business continues to execute at a high level, investors were simply paying too much for the stock 12 months ago. It doesn’t take much to bring a lofty valuation back down to earth. However, this sets the stock up very nicely for 2018 (and many years to come). While the company’s five consecutive years of dividend increases is a bit shorter of a track record than I’d typically like to see, the dividend growth has been tremendous: the stock’s three-year dividend growth rate is sitting at 44.2%. With a payout ratio at only 31%, there’s plenty of room for much more dividend growth from the perspective of payout ratio expansion, and that’s before factoring in business growth (which is phenomenal, as we’ll see shortly). But this stock only yields 1.58% here. As such, this is a stock for younger investors who have time for the “growth” in dividend growth to manifest into a lot of aggregate income and capital gain. Fortunately, growth is something this company excels at. We’re talking top-line compound annual growth on the order of 5.44% over the last ten fiscal years, with EPS compounding at an annual rate 19.53% over that period. A lot of excess bottom-line growth here, propelled by a combination of significant share repurchasing activity and impressive margin expansion. For perspective, the outstanding share count is down by over 35% over the last decade. That’s incredible. Most restaurants are franchised, meaning this is essentially a “cash cow” of a business that takes in plenty of cash flow without a lot of overhead. The balance sheet is solid, with an interest coverage ratio of over 23. And net margin came in at over 6% for FY 2016. That’s almost double the 3.08% it finished at for FY 2007. One could argue there’s room for even more expansion here. Meanwhile, the valuation is about as low as it’s been in years. The stock is trading hands for a P/E ratio of 19.6, which is obviously advantageous when compared to the stock’s five-year average P/E ratio of 28.4. Investors are also paying much less for the company’s cash flow relative to its three-year average. And we’re talking about a company that’s grown at almost 20% annually over the last decade. Yet the valuation is below the broader market. If you want to find a clear case of above-market growth at a below-market valuation, this is it. I performed a quick two-stage dividend discount model analysis on the stock to come up with a valuation. Assuming a 10% discount rate, a 13% dividend growth rate for the next 10 years, and a long-term dividend growth rate of 8%, an estimate of intrinsic value comes out to $74.07. I think this is reasonable. Frankly, the stock was at that price just a few months ago – after it had already fallen off of a high valuation. That would set us up for 32% upside right off the top. An estimate of its near-term compound annual EPS growth is at 13%. And then you have that modest yield. Adding it all up leads us to what could be a 45+ total return for 2018. The next 12 months could be phenomenal for the stock, but an investor’s time frame for this stock should be as long term as the world’s hunger for high-quality pizza. This is the only stock on this list I don’t personally have a position in, but I’m considering investing buying the stock very shortly. Bottom line: These are all high-quality dividend growth stocks that are set up for a great 2018. This is after considering fundamentals, competitive advantages, risks, and valuation. While there are no guarantees as to how these stocks will perform for investors, I can say that I’m walking the walk: I’m personally invested in 9 out of these 10 stocks. But as great as things look for 2018 for these businesses, every single investment should be thought of as a long-term play on basic trends that have long runways and strong tailwinds. While investors wait for stock prices to rise, they can enjoy the growing dividend income these stocks are paying out. It’s truly a situation where you can have your cake and eat it, too!